We now come to the difficult and intricate matter of identifying the star that the Magi saw in the East, and that ultimately led them to the place where Christ, his Mother and Joseph were (Matthew 2:1-12). Much has been written about this famous incident, and there have been proposed many varying identifications for the star. It has at various times been identified as a comet; a new star; a conjunction of planets; a supernova. St. Augustine sometimes argued that it was a regular star of the heavens (e.g. in Serm. Epiph. ), at other times that it was a new star appearing, for instance in the constellation Virgo (Contra Faustum, Bk. 2, ch. 5 a med.). St. Thomas Aquinas, following Chrysostom, was more inclined to the view that the star of the Nativity was not a regular part of the heavenly system; but was a newly-created star (Summ. Theol. IIIa, q. 36, a. 7). But he did allow for other opinions: viz. that it was an angel or a visible manifestation of the Holy Spirit. He also quoted Pope St. Leo (Serm. de Epiph, 31), who wrote that the star must have been more bright and beautiful than the other stars, for its appearance instantly convinced the Magi that it had an urgent and important meaning. We know from Scripture that the heavenly bodies were invested by God with a fourfold function: “… for signs, and for seasons, and for days, and years” (Genesis 1:14). The point of the “days and years” is obvious. The Hebrew word ‘moed’, translated as “seasons”, is used to indicate something fixed or appointed. When it is used of time, according to Ben Adam (Astrology, p. 49), “it is always a predetermined time – a time in which something predetermined is to happen”. It is never used in Scripture to denote any of the four seasons of the year. Already we have seen how God uses the various heavenly bodies for seasons in this sense, and for signs or symbols. An understanding and study of God’s purpose and meaning in relation to the lights of the firmament is true astrology, as opposed to the divinely forbidden and foolish astrology that is fatalistic. Dr. E. Bullinger (Witness of the Stars, 1893) has shown that the constellations of the zodiac, when read in the correct (not popular) order, and with their original (not corrupted and later) designations, give us a condensed history of the fulfilment of the divine promise made in the Garden of the coming Deliverer, the seed of the Woman, and the crushing of the serpent’s head (Genesis 3:15). According to Bullinger, this truth of the witness of the stars is told in Psalm 19:1-4: “The heavens are proclaiming the glory of God; and the firmament shows forth the work of his hands .… No speech, no voice, no word is heard, yet their message goes out through all the earth, and their words to the utmost bounds of the habitable world”. In the sign Virgo, where the true beginning lies for reading the circular zodiac (not in Aries, according modern belief) is the commencement of all prophecy in Genesis 3:15: “I will put enmity between you and the Woman, and between your seed and her seed. She shall crush your head, and you shall lie in wait for her heel”. Later prophecy identifies this Woman as being of the stock of Israel, the seed of Abraham, the line of David; and, further, She is to be a virgin: “Behold, a virgin shall conceive and bear a son, and shall call his name Immanuel” (Matthew’s inspired adaptation, in 1:23, of Isaiah 7:14). The first constellation in Virgo is Coma, represented by a woman and child, and meaning “the desired”, or “the longed for”. We have the word used by the Holy Spirit in this very connection, in Haggai 2:7: “The DESIRE of all nations shall come”. Bullinger and others have suggested that it was in all probability the constellation of Coma in which “the Star of Bethlehem” appeared (op. cit., p. 36). He also recalls a traditional prophecy, well-known in the East, “carefully preserved and handed down, that a new star would appear in this sign [i.e. of Coma] when He whom it foretold should be born” (ibid., pp. 36-37). And a sceptre shall rise out of Israel. This two-fold repletion of an idea – where the two nouns in the first verse correspond effectively to the two nouns in the second verse (thus ‘star’ to ‘sceptre’, and ‘Jacob’ to ‘Israel’) – so characteristic of Hebrew and Canaanite literature, also points in this case to a two-fold fulfilment of the prophecy. These words were fulfilled in a minimised sense a millennium before Christ, during the reign of David, the sceptre of Israel, and descendant of Jacob. But the prophecy would not be properly and completely fulfilled until the time of the Incarnation and the Birth of the true Messiah, who would be known as the “Son of David”. “Jesus is King throughout all eternity by nature and by right of conquest: through Him, with him, and subordinate to him, Mary is Queen by grace, by divine relationship, by right of conquest and by singular election”. (As quoted by Fr. Wm. Most, Mary in Our Life, p. 25). Matthew (2:1-12) is the only Evangelist to narrate the incident of the star seen by the Magi, leading them to the Christ with his Mother, Mary, in David’s city of Bethlehem. What does Matthew tell us about this star? That the Magi had seen it in the East, calling it “His star”, and that it indicated that He was to be worshipped as King of the Jews (2:2). And, later, that Herod determined from the time when the star first appeared how old the Child was (2:7). Finally, Matthew narrates that the Magi were filled with joy when they saw the star, after their meeting with Herod, and that they followed the star which “went before them, till it came to rest over the place where the Child was” (2:10-11). Two things are to be noted here. Contrary to popular belief, nowhere at all does Matthew say that the Magi followed the star from their own country to Judaea! He simply says that they saw the star in their own country, “in the East”, and that they came to Jerusalem to worship the King of the Jews. Once there in Jerusalem, they see the star and are filled with joy, and from Jerusalem they follow the star to Bethlehem, and to the very place where the Child is to be found. There the star comes to rest. From this last attestation some Bible-believing astronomers will assert that the star of Bethlehem was entirely miraculous, and was not a known heavenly body (star, planet, comet, nova, or conjunction). 1. The star of Bethlehem could not have been a meteor or a meteorite; the life of one is too short. 2. Likewise, the star could not have been a comet or a nova without having attracted world-wide attention. Neither seems to have been present at the time of Our Lord’s Birth; although, according to J. Bjornstad and S. Johnson (Star Signs and Salvation in the Age of Aquarius, p. 60), “there may be an indication from Chinese records that a nova did appear around this time”. Nevertheless, while a comet would appear to move, a nova would not. 3. Perhaps the most popular identification of the star of Bethlehem – because this identification fits the dates proposed today as being most likely for the event of the Nativity – is that it was in fact a conjunction of two or more planets. Kepler (1571-1631) was the first astronomer to point out that three times in BC 7 there were conjunctions of the planets Jupiter and Saturn (now estimated at May 29, September 29, and December 4). These conjunctions occurred in the sign of Pisces (Bullinger, op, cit, p. 39). An event such as this is comparatively rare, happening only about once every one hundred and twenty-five years. A major objection to this particular conjunction, however, is that the two planets never seem to approach one another closer than twice the distance of the moon’s diameter; “therefore they could never have been viewed as a single star” (Bjornstad et al, ibid.). Obviously, then, the difficulty of the ‘star’s’ appearing to be standing over Bethlehem while the Magi were looking on, is a major obstacle to accepting this interpretation. 4. Similarly, early in BC 6, another conjunction – even more unusual – occurred: the conjunction of three planets. This phenomenon happens only about once every eight centuries. At this time Mars, Jupiter and Saturn appeared to approach one another very closely. (Some of the objections mentioned in no. 3 apply here also. None of these conjunctions, however, occurred in the year BC 8 (Mackinlay’s tentative date for the Birth of Christ). Nor have we found any evidence to support Bullinger’s belief that “His star” - the “Sign of His coming forth from Bethlehem” (op. cit., p. 39) – was “a new star” that appeared in the constellation of Coma (in Virgo). Let us then return to our reliable guide, Mackinlay, to see if he has arrived at a more satisfactory identification of this “star” which would arise “out of Jacob”. Mackinlay has rightly noted that “it appears to be a principle in miracles to use existing agents in a miraculous way, rather than to create fresh ones” (p. 151). This statement is borne out throughout the Scriptures; for instance, when Joshua wanted light, another sun was not created, but the light of the existing one was employed to the necessary effect (Joshua 10:12); and when Our Lord fed the multitudes, he did not specially create bread, but miraculously multiplied the existing stock. Also, at Fatima in 1917, God worked a miracle of the sun that already shone in the sky; it was not a miraculous new sun that danced above the crowds. Mackinlay (quoting Alford’s Commentary on the New Testament) remarks that “the expression of the Magi, ‘we have seen his star’, does not seem to point to any miraculous appearance, but to something observed in the course of their watching of the heavens”. This seems natural and probable. Further, as we are told (according to Mackinlay) of a subsequent miraculous change in the star seen by the Magi, and after that again of divine information given to the Magi in a dream, it seems natural to suppose that no miracle at all had happened to the wise men prior to their arrival at Jerusalem, because we are not told of any divine interposition before that time. Mackinlay also dismisses the suggestion that, because the Magi referred to ‘His star’, it must have been one specially sent for the occasion. This suggestion, he says (p. 152), “can have no weight, because when Christ was speaking of God the Father in the Sermon on the Mount He said, “He maketh His Sun to rise on the evil and the good” (Matthew 5:45). As the ordinary great luminary is certainly intended in this passage, it must follow that the expression “His Star” may refer to one of the well-now orbs of heaven”. With reference to the suggestion by Kepler and other astronomers that the star of Bethlehem was a conjunction of planets, Mackinlay notes that “the appearances at conjunctions depend on the positions of two or more stars, and they are changing from night to night”. We have no account of “stars”, he adds (p. 153), “nor of any special alteration until the marvellous change when the single Star moved in front of the Magi and led them on their way from Jerusalem to Bethlehem, and no appearance at a conjunction of planets could explain that wondrous movement”. What were the characteristics of the star seen by the Magi? (1) Twice it was mentioned specially as being seen “in the East” (Matthew 2:2, 9), inferentially it was not also to be seen in the South and West as are the other stars. (2) It had been visible for some considerable period; the wise men doubtlessly had seen it in their own country, from which the journey might involve weeks, possibly months, of travel. That it had appeared for some considerable time is inferred also from Herod’s question, as to “what time the star appeared” (Matthew 2:7), and from his subsequent action in fixing on the maximum age of the infants to be murdered “from two years old and under, according to the time which he had carefully learned of the wise men” (Matthew 2:16). “What ordinary celestial body bears the characteristics we have just referred to”?, Mackinlay asks (p. 154). “Surely the reply must be the Morning Star, which is only seen in the East, and which shines continuously at the end of each night for a period of about nine lunar months in the latitude of Palestine, an object which the Magi must have observed over and over again in the course of their watching of the heavens”. Modern writers, he adds, have failed to make this identification, most probably because of the very small importance that is now attached to the morning star. But, as we saw in Chapter One, the herald of dawn was a very familiar object indeed to the Easterners in biblical times. By imagining oneself in the position of an ancient Jew, it seems highly probable that any mention of a star in the East would suggest to the mind the most familiar of all stars, so often watched for before dawn, and seen only in the eastern quarter of the heavens. Early Christian writers speak of this star’s “surpassing brightness” (see Bullinger , op. cit., p. 39). St. Ignatius of Antioch, of the C1st AD, says that “at the appearance of the Lord a star shone forth brighter than all the other stars”. Even these descriptions admirably fit the planet Venus. Professor A. Roy notes that “Venus, in fact, at its brightest, is very much brighter than Sirius. Apart from the Sun and Moon, there is no brighter object in the heavens. Of course, there are times when it is invisible – when it goes behind the Sun, for example – but Venus can be so bright at night that it can actually cause an object to throw a shadow. It can also be seen with the unaided eye during daylight. But of course, it is always a morning or an evening object. Because it is never seen far, angularwise, from the Sun” (“The Astronomical Basis of Egyptian Chronology”, SIS Review, Vol. VI, #’s 1-3, p. 55). The Magi had seen the morning star shining for its full period during that year of the Nativity, in the East. But they had to delay their trip to Jerusalem until the appropriate season for travelling arose, and after the necessary preparations had been made (more on this later). They travelled westwards, in faith, leaving the diminishing morning star behind them. They did not see the planet Venus again until after their interview with Herod. Since Herod “summoned the wise men secretly” (Matthew 2:7), it is fairly safe to say that it was night time. 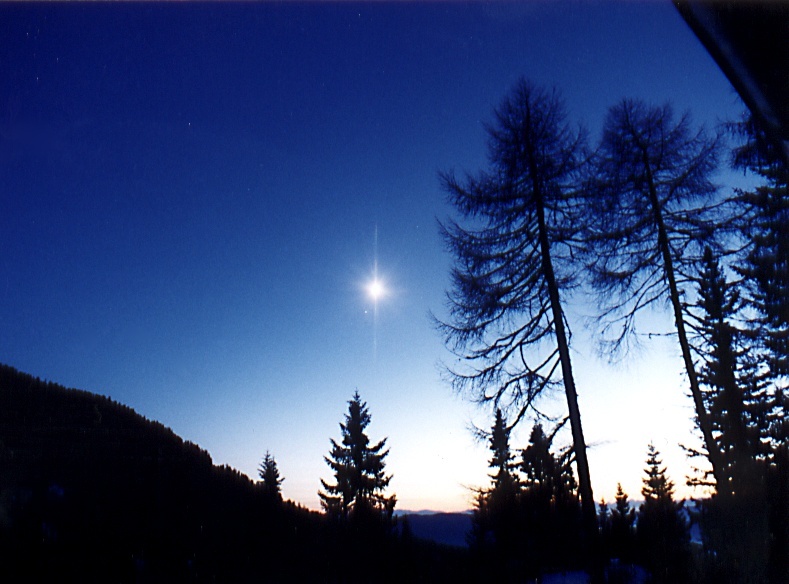 The star re-appeared now as the evening star, in the western sky. This is all very appropriate. Our Lord’s Birth in the stable, heralded by the shining of the bright morning star, was a time of great joy. But by the time of the Magi’s arrival, when the Holy Family was by then dwelling in a “house” (Matthew 2:11) in Bethlehem, a sinister element had entered in. Herod and all Jerusalem with him were troubled at the news of the Magi, and soon Herod would order the murder of all the male children up to two years of age – according to Greswell (Dissertations Upon a Harmony of the Gospels Vol. 2, p. 36), the Jews reckoned that a child who had completed one month of his second year would be reckoned as being two years old. Though the Magi “rejoiced exceedingly with great joy” (Matthew 2:10) when they saw the star again, not aware of Herod’s treachery, its brightness appropriately by now was enshrouded by the darkness of night. It was only then, at the re-appearance of the star this time in the western sky – as we think – that God may have effected a miracle upon it; causing it to go before the Magi. We have a modern C20th example of the Miracle of the Sun at Fatima (October 13, 1917). The sun began to spin and to hurtle towards the earth. In the case of the Magi, the evening star may also have appeared to have left its normal place in the sky, and to descend near to the earth (unless it was just simply a case of the Magi’s heading towards the Star and providentially coming upon the house where the Holy Family was now dwelling). In both cases, the miracle may have been seen only locally, not world-wide. It would not be so surprising that the planet Venus should bow down in homage above the infant Saviour. Even the Patriarch Joseph dreamed that the sun, moon and stars bowed down before him; how much more for Jesus Christ! If we accept Mackinlay’s conclusion arrived at from Gospel harmonies that the morning star was actually shining at the time of the Nativity, the probability that it was identical with the star in the East seen by the Magi is evidently increased greatly. It seems that we can no longer escape this identification of the star of Bethlehem with the plant Venus. For full article, see earlier post "Was Jesus Christ Really Born in Winter?" Words Found on Shroud of Turin?